Lock in a great price for eLoftHotel – rated 8.6 by recent guests! Great place to stay, modern, clean, very good price, and the staff are terrific! The bed was comfortable, the breakfast was great, lots of variety! I arrived at approx. 9:30 and despite check in time was 14:00 at 10:00 I had been given vacated room. I was also alloved to check out at 14:00 instead of normal 12:00. And all that at no additional cost! Very friendly staff at reception! Rooms are very well decorated and cleaned. Assuming low accomodation price and my overall excellence experince would consider to come back and recommend to all my friends to stay. That's a modern hotel with friendly stuff. Room was spacious and clean with a big bad. Bathroom was very comfortable. Breakfast is simple but includes all sorts of food you want to see there. We could have stayed there for a week. The city centre is walkable, took us around 15 min to get there. The area seemed safe. Enjoyed King size bed. I would also like to take 'boss' table home. Excellent customer service. Clean and quiet rooms. Very cosy and soft touch bed and linen. Easy to reach airport, town centre and shops. The staff is very friendly, the breakfast was good, the hotel is clean and tidy, the wifi works fast. Everything was fair for the price. The free parking was also very important when we chose this hotel. Comfort, size and design of room, cleanliness an fresh equipment. 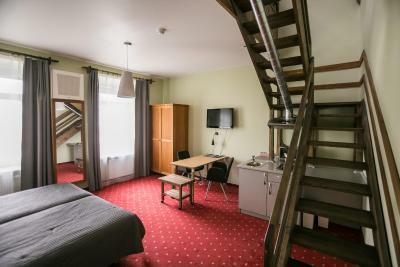 Very comfortable room, clean and beautiful bathroom, location near enough to the old city. Everything works. Friendly reception. New art on walls. eLoftHotel This rating is a reflection of how the property compares to the industry standard when it comes to price, facilities and services available. It's based on a self-evaluation by the property. Use this rating to help choose your stay! 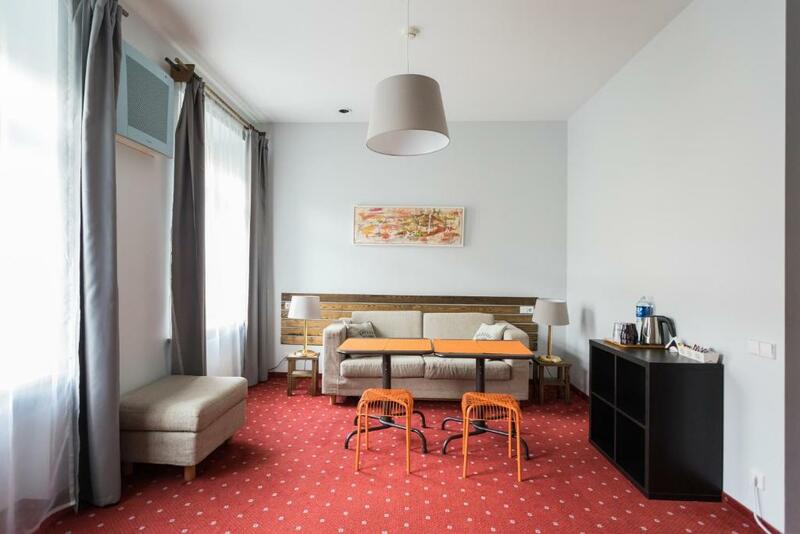 One of our top picks in Vilnius.eLoftHotel is located only a 10-minute walk from the Vilnius Old Town. 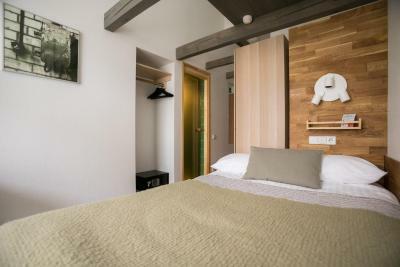 It features a sauna available at an extra charge and elegant rooms with free Wi-Fi and air conditioning. Free on-site parking is provided. All rooms at the eLoftHotel are soundproofed and classically decorated. Each comes with satellite TV, a refrigerator and a modern bathroom. Ecological materials are used throughout the entire hotel. A continental breakfast is served every morning at the on-site coffee bar, where a selection of coffee and snacks is offered. 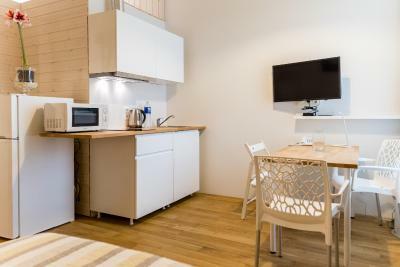 There is a common kitchen, fully equipped, which also comes with a washing machine and a tumble dryer. Front desk staff is available 24 hours a day and can arrange car rental, laundry and dry cleaning services. eLoftHotel is located 1.2 mi from the Town Hall. Sights such as the Royal Palace of Lithuania or St. Anne’s Church are within 1.2 mi from the hotel. When would you like to stay at eLoftHotel? 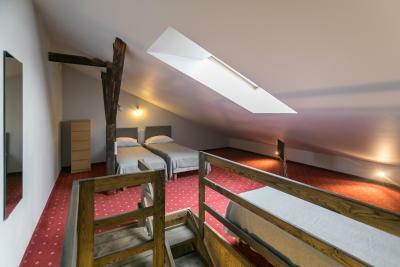 Room with free internet, satellite TV and air conditioning. More spacious room with free internet, a kitchenettea satellite TV and air conditioning. 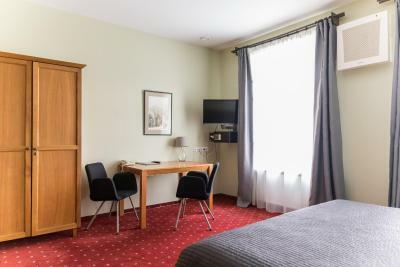 This twin room has soundproofing, satellite TV and central air conditionong. There is no possibility to add an extra bed in this type of room. This twin room has soundproofing, satellite TV and central air conditioning. There is no possibility to add an extra bed in this room type. 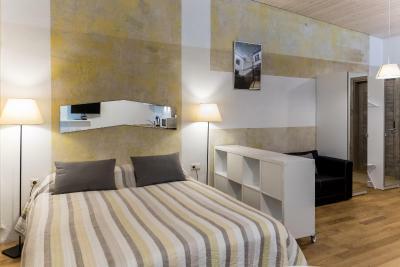 This twin room has air conditioning, kitchenware and stovetop. This apartment features a kitchenware, air conditioning and satellite TV. Come and stay with us, you will be surprised of how much you will like us, this is what our guetss say: “Better than expected. Great value for money. Cozy and clean. Nice staff. The young lady at the front desk who checked me in is an absolute sweetheart.” You are welcome too. House Rules eLoftHotel takes special requests – add in the next step! eLoftHotel accepts these cards and reserves the right to temporarily hold an amount prior to arrival. A late check-out is possible up until 6 pm, for an additional fee. It took some time to find hotel enrance inside a block. We reccomend to illuminate entrance and name plate ovet entrance doors - will be conveniently seen from distance! A bit lively surroundings at nights with loud voices. Also when other inhabitants were discussing in corridor lounges at nights, everything was heard in the room. 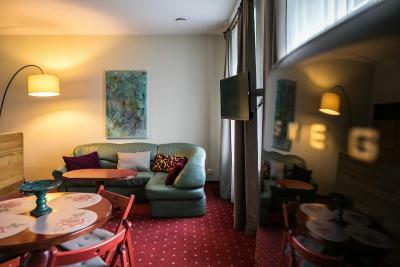 The apartment was so big and the decoration was even better!it is in a great location near the old Town! Also Steve is very helpful and welcome guy! The only thing that wasn't OK is a sofa-bed in the middle bedroom that wasn't for sleep! Nothing at all. My wife is very demanding but even she can't find nothing wrong and wants to come to EloftHotel next time. I stay in hotel 7th time and will book in future again. Hotel meet all my needs. Easy access from / to airport. Hotel based inside yard no excessive noise from streets. Two superstores in walking distance ; Rimi to the left and Maxima ( open 24/7) to the right. I needed to do shopping in Maxima at night time because become unexpected meeting to attend so i get all formal clothes for it. I specially my and my wife thankful for Hotel staff : reception ladies ready to help all the time and resolve issues without problems ( I my case night arrival and late departure). Reception speaks languages what we need to communicate. I read one ukrainian lady was unhappy , she state " Girls on reception not speaking in english just russian". She provided wrong information. My and My wife have no problem at all to speak in english in reception. Hotel and rooms are very clean, thank for cleaners. A special thank you for hotel for very comfortable beds. My wife suffer from back pain but she said " I'm slept like a baby , no back pain at all . Beds are very comfortable". Heating perfect in room too. Breakfast available for 5 euros as additional option. But believe me it's good breakfast. As I said on previous feedback there is lots of various food to choose, coffee , tea, juses, hot food or sandwiches to make , whole eggs or cut in halph with mayo, various salads, cheeses and bakery. You can buy dinner for 7 euros too with lots of food selection including soups . Breakfast and dinner are on " eat as much as you can " basis and allocated in sister hotel just around corner approx 1 min walk. Coffee , tea and some soft drinks available in hotel lobby. WiFi excellent, stream video shows perfect. Rooms have a little fridge, kettles , cups and spoons to make coffee or tea. Car park available but I'm not use car because cheap taxi on app available in Vilnius. AmEx cards are not accepted but according to the info on website, they are. I paid for the breakfast but nobody informed me in advance the breakfast was served in another hotel, 10 minutes walk from eLoft. Fortunately I had some spare time booked for unexpected incidents and walked there for breakfast. 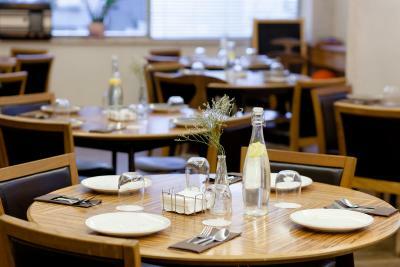 Very good and comfortable place for longer business stay. 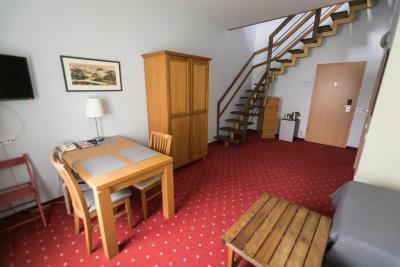 Calm location, close to city center. There were separated bed room and sitting room. Small bathroom with a shower (shower head fixed to the wall). The staff was friendly and the location was good.